"In 2011 I attended the 'Chefs of the Coast' cook-off where 4 chefs battled it out cooking their own personal recipe using Four Roses Bourbon®. I thought that I could absolutely make a burger worthy of the Four Roses name and this is it. It's a savory burger that is seasoned to perfection and topped with bacon and other assorted toppings." Mix ground beef, bourbon, Worcestershire sauce, brown sugar, steak seasoning, and garlic salt in a bowl; divide and shape into 2 patties. Cook on the preheated grill for about 5 minutes; turn, top each burger with bacon and Cheddar cheese, and continue cooking until the burgers are cooked to your desired degree of doneness, about 5 minutes more for well done. An instant-read thermometer inserted into the center should read 160 degrees F (70 degrees C). 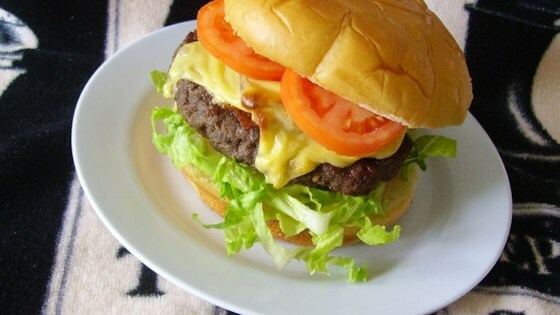 Serve on split buns topped with tomato and lettuce. Pure awesome. Everyone loved them. Couldn't get enough. These were pretty good, but I was expecting more. I'll make again, but it won't be a regular. Excellent! I used ground pork instead. It makes sweeter burgers, so I suggest a pepperjack cheese, or some fresh jalapeno for a balancing kick. These were good. My son wouldn't eat it, and my daughter loved it. Has a nice flavor to them, think that's what threw my son off. I would make them again. Next time I will have a few plain ones.